Stuffed katayef is always present as a dessert during the Holy month of Ramadan and Eid, it is one of the food heirlooms passed down from generation to generation. It is basically a pancake “Arab-style”. The traditional katayef is made with milk then stuffed with walnuts, cream or sweet cheese and folded over to resemble a half-moon shape. It is traditionally deep fried and whilst still hot, soaked in Arab-style syrup. 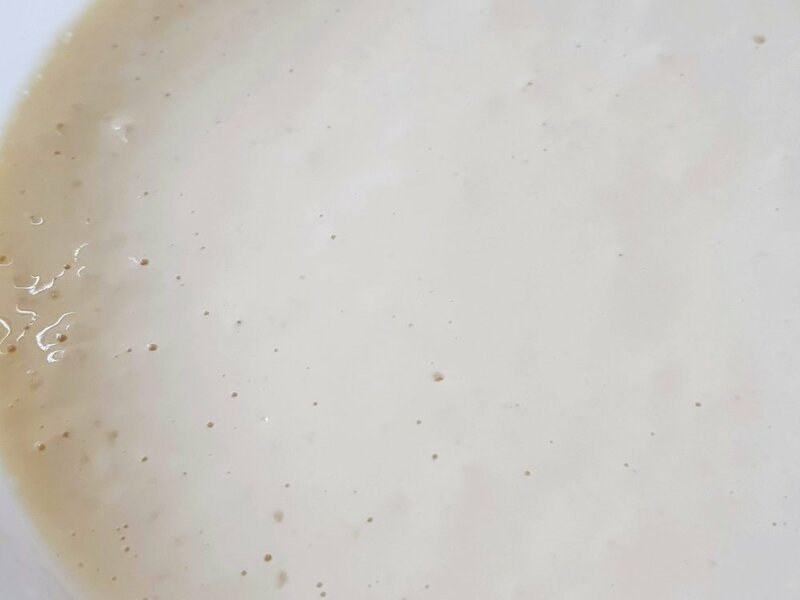 I have made this Recipe using almond milk in order to accommodate people with dairy intolerances but dairy milk in the same quantity can be used. It is true that katayef is readily available in the market but it is so fast and easy to prepare you can do without that errand. Give it a go and see for yourself. * Sift the flour, then add all the ingredients together, mix and put aside to rest for about 15 to 18 minutes only. * When you see small bubbles forming on the surface as seen in the picture, it is ready. * Heat a pancake pan or tava or a skillet on medium heat and when it is hot, drop in a 1/4 cup of the batter and leave it without turning until the surface is dry and forms hollow pockets and the base is golden brown. Place on a kitchen towel to cool down then stuff with your choice of filling. * You can use dairy milk or any other non-dairy milk. Per Serving: 976 calories, 4g Fat (3.4% calories from fat); 28g Protein; 204g Carbohydrate; 8g Dietary Fiber; 0mg Cholesterol; 27mg Sodium.